Teton Family Magazine’s privacy statement has been created to protect your privacy. We are committed to keep all customers’ information confidential and secure. This policy administers the manner in which Teton Family magazine uses and maintains information collected from its customers. At Teton Family magazine, we are extremely serious about security in order to protect your confidential information. 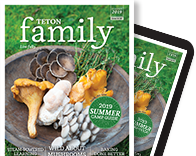 Teton Family magazine uses encryption when transmitting date on tetonfamilymagazine.com. All financial information is encrypted, and our company databases are accessible only to internal employees. Occasionally Teton Family magazine may send our customers information about our company and get in touch with you when necessary. Teton Family magazine will not otherwise disclose its customer’s personal information and account information unless Teton Family magazine has reason to believe that disclosing such information is necessary to identify, make contact with, or bring legal action against someone who may be causing harm or interfering with the rights or property of Teton Family magazine, Teton Family magazine’s customers or others. Teton Family magazine will never disclose personal information to third parties. Teton Family magazine may update this policy statement.